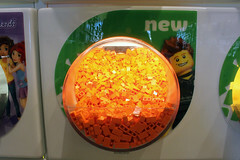 I finally had time to get to my local LEGO Store to check out the new elements on the Pick-A-Brick Wall. 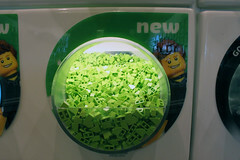 During each quarter of the year, you can expect some new stuff showing up on the wall that you may not have seen before. 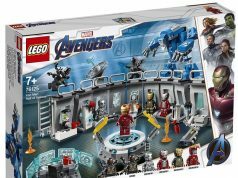 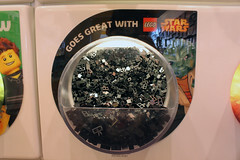 Some of them are labeled with themes that the parts would go well with and for this quarter they include LEGO Star Wars and LEGO Friends as well as some that go well with anything in general. 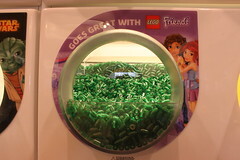 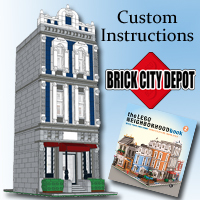 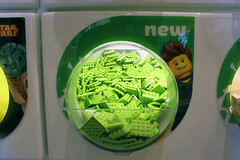 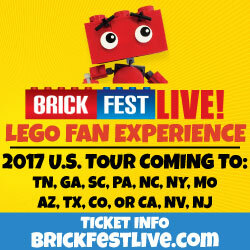 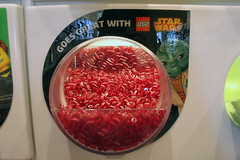 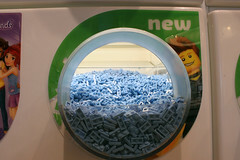 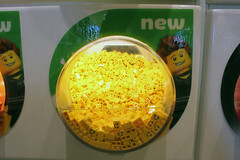 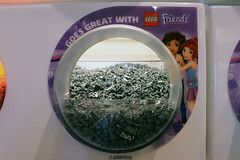 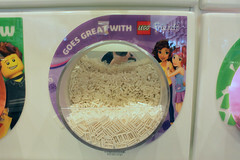 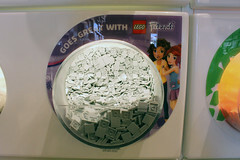 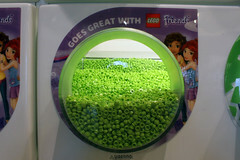 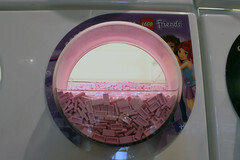 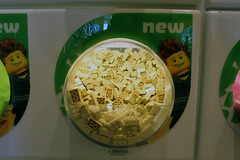 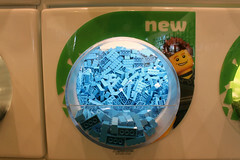 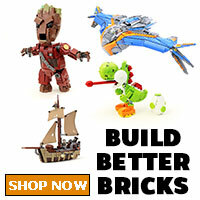 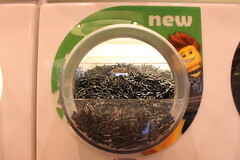 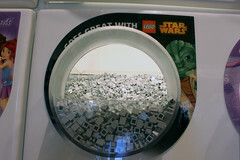 From my understanding, these elements are sent to LEGO Stores throughout the US so you may also have seen them already. 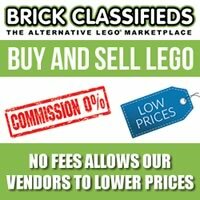 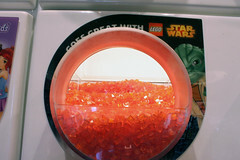 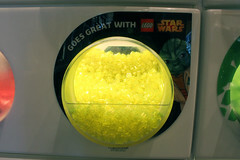 For elements that go well with LEGO Star Wars, we have light bluish gray modified 1x1s with handle, trans-orange cheese slopes, trans-red round 1x1s, trans-neon yellow round 2x2s, and black 1x2s with clip. 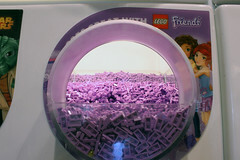 For the LEGO Friends elements, we got pink 1×2 tiles, lavender 1×2 plates, lime green 1×1 studs, dark bluish gray modified 1x2s with arms, light bluish gray 2×2 tiles, white modified 1×2 grills, and trans-green round 1x1s. 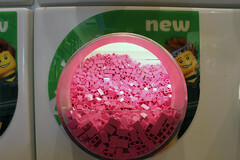 Finally for the general parts, there were black modified 1x1s with headlight, medium blue 1×2 plates, orange 1x2s, yellow 1x2s with printed face, dark pink 1×2 bricks, tan 2x3s, lime 4×4 plates, medium blue 2x4s, black palm tree tops, and lime 45 slopes. 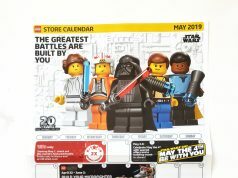 Overall, there are some very nice elements for this quarter with some of the more popular ones being the grey 2×2 tiles, the yellow 1x2s with faces, and surprisingly the medium blue 2×4 brick. 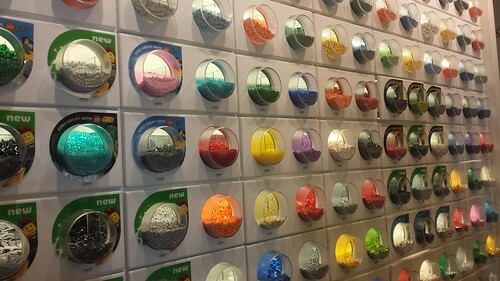 Again, shout out to Genevieve for keeping the wall looking awesome. 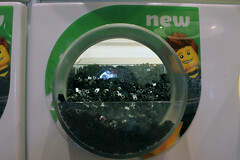 Stay tuned because in an upcoming post, I will be talking about the new elements from the Build-A-Minifigure bar. 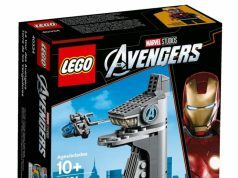 Next articleLEGO Pirates 2015 Chess Set Coming This Year?